Cool and quench your sun-drenched skin with this non-greasy refreshing spritz. A brand new version of our popular Cool Zhuzh! 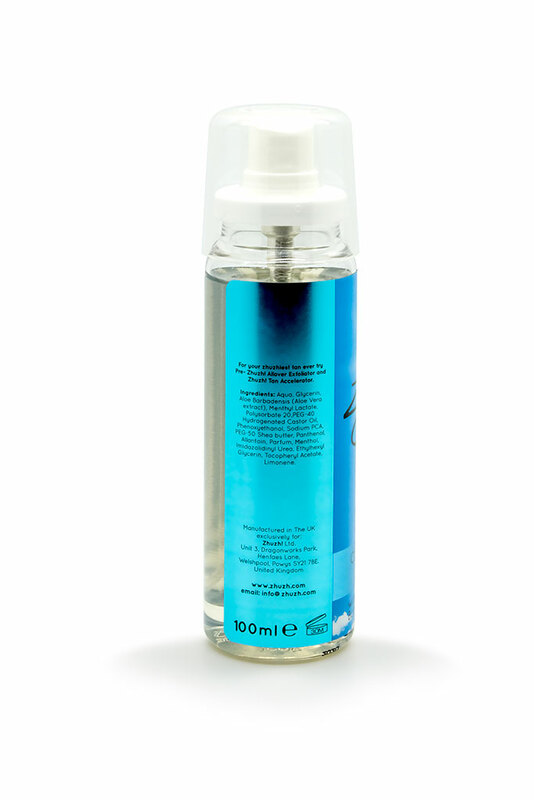 still packed with Aloe Vera and Shea Butter to soothe, calm and moisturise your skin now in a handy spray formulation. Simply spritz onto your body and face whenever your skin feels in need of refreshment – the menthol will instantly cool your skin while the moisturisers get to work hydrating it to help prevent dry patches and flaking. Top tip – keep it in the fridge for an even stronger cooling effect – Cool Zhuzh! has been described as “air conditioning for your skin”! The Aloe Vera Cool Zhuzh! just brilliant never leave home without it !! !i now get a brilliant tan even on my legs which have been able to get them tanned !!! i chose this product because its brilliant and it works i would recommend it to everyone it does exactly what it says on the tin . This was recommended whilst on holidays by two sisters late 60s – they looked nut brown. Purchased it through Amazon as a lot cheaper than abroad, charged 60 euros !!! in lanzarote. Have used it a few times whilst home in the garden, certainly speeds up the tanning, girls in work said I look like I been away for a week ha ha. What I like I can spray it on, smells lovely and carry on doing my chores or relaxing. Don’t forget put your normal sunscreen on also. Fab product. Really quick delivery. I would highly recommend. I never ever tan, but this has given me the best tan ever. I have a can in my bag always, and it smells great. Never be without it now. use this product with sun you get a great tan ! but be aware there this contains NO sun protection.